A selection of fly lines. How to choose the right fly line for your style of fishing. Up until the mid-1950s, the traditional ﬂy line was made of silk. These silk lines needed particular attention after every outing. They needed to be removed from the reel, dried in big loops or put 9on to long thin drying racks. After being dried they were re-greased with the appropriate treatment of the day. Since that time there have been two modem marvels the ﬂy angler has had to move up with. The development in man-made ﬁbres for use in fishing rods has been impressive, but the rod merely provides alternatives to its predecessor. 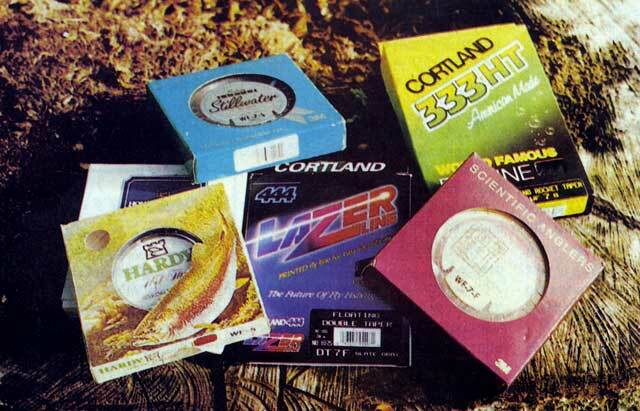 The development of the modern ﬂy line is a result of scientiﬁc advances of plastic coatings. Each year these improve and in the modern world of fly lines today there are many different varieties available. To a beginner, the assortment of ﬂy line types can be bewildering. We still have a few level lines available, but most now are double tapered, weight forward and also the long distance casting line called a shooting head. There have been other innovations in the meantime. These include sink tip lines of varying lengths and densities, ever increasing sinking rates and specially designed tapers for some saltwater fishing. The choice of the right ﬂy line for the particular fishing situation has become both difficult and more important. It is vital to understand the line weight system of AFTMA numbering and harness this to the rod’s capability. All rods nowadays have written on them the weight of line that suits them. The expert casters have put many hours into determining which is the correct weight of line to match with each rod. The AFTMA standard is set out by the American Fishing Tackle Makers Association. This code applies only to the weight of the forward 30 feet of line, thus the ﬁrst 30 feet of a five weight line, for example, weighs about 140 grains. This system allows rod manufacturers to match rod action to the particular line weights ensuring that the rod and line work together properly. By choosing your ﬂy line size you are actually determining the style of fishing. The light fly line variation of 3-5 is suitable for dry fly and nymph work on streams and small still waters. The medium fly line of 6-7 weight is suited to all round use with the bias to small, still waters and reservoirs. This, of course, means that the heavy lines of 8-9 are good for distance work and especially lure fishing and sinking capability. The Taper, marked on the side of every line box, gives the line taper abbreviations as used by the tackle manufacturers. They are DT (double taper), WF (weight forward taper) and ST (shooting taper). The double taper has an elongated thick belly that assists picking up from the water as there is generally sufficient weight to load the rod on the initial movement when aerialising the line the back cast. The double taper is often recommended for newcomers. It is a favourite with nymph ﬁshers who also need the ability to take a line from the water at one range and immediately cast the nymph into another area to cover a moving ﬁsh. One other advantage with the double taper line is it is the most economical for the average angler due to the fact that it is reversible (when one end wears out the other end can be employed). As most trout in river fishing are taken at reasonably short distances my advice to the beginner is to procure a double taper line ﬁrst for coverage of both dry and nymph fishing in rivers and lakes. Of course, you can also use this line as a wet fly fishing line across or downstream. These lines have a shortened belly and extended thinner running line and are generally chosen with distance in mind. It is important to remember that you must always cast with a little of the back taper in the tip ring. This avoids a collapsed cast either on the back or front movement. Anglers should also remember that if they want to avoid ruining their ﬂy line after only a few weeks casting, this thin running line cracks and distorts easily and it will not hold the heavy front taper up in the air when it extends beyond the tip ring. The anglers advantages are once delivering the line into the air the heavy shortened belly can pull with much more ease the running line with little wind resistance through the air and so deliver a much longer cast on still waters. These are the ultimate distance weapon. They are backed with a suitable running line of mono and are really only for experienced anglers familiar with double hall casting. The next decision that has to be made is whether you intend to have ﬂoating or sinking lines. On the side of the ﬂy line box it will have either a “F” for ﬂoating or “S” for sinking and if you intend to go for a sink tip it will also include that, so the configuration that will be on the side of every fly box is, for instance, “DT 6F.” This stands for double taper, weight 6 and a ﬂoater. Weight forward would read “WP 6F.” Some manufacturers are now including on their lines all this information so that you can easily find this by pulling off the first few metres. This saves having all this information on the ﬂy reel or spool with the sticker supplied by the manufacturer. These always come off anyway. Although it is not part of the coding on each fly line box, an additional factor that is very important for proper selection is the line colour. Fly line nowadays is made in a wide variety of colours. The fishing conditions you encounter most often should be the factor you use to decide which colour is best for you. It is very difficult to control a line that is hard to see. This is why most anglers prefer a highly visible colour such as the pinks, ice blues, pale fawns, all colours that are easily seen while on top of the water. Being able to see your line while it is on the water has obvious advantages. For example, a highly visible line is a necessity for the nymph angler. In most cases, the strike can only be detected by watching for a slight twitch or pause of the drift of the line. There are other advantages as well, especially for beginners, as it can improve your casting by watching the action of the line in the air and by analysing your own casting loop it is easy to spot any casting problems you might have and to make the necessary changes to correct them. Contrary to popular belief, in most situations highly visible ﬂoating lines will not spook fish. Because the line is ﬂoating on the surface and is normally backlit by the bright sky all colour appears as a dark silhouette from under the water. By using the proper length leader and avoiding casting directly over ﬁsh it is possible to use a highly visible line in most situations. If you intend to fish a lot of high country streams where the water is gin clear it is then necessary to go to the darker line, not for the fact that the fish can see it sitting on the water, but for the fact that as you pass it through the air it is quite visible to the ﬁsh and again it is visible just before it lands on the water surface. So if all your fishing is high country, gin clear streams, you should buy a dark coloured line. In this case, you may need to use a very small strike indicator. However, in most situations, you can actually see very clearly what is happening. There is one new line which is just becoming available and that is the clear glass line. 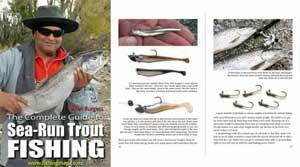 If this line is successful it will be excellent for downstream wet ﬂy ﬁshing as well as just under the surface ﬁshing, which is often an important area of dams, lakes and reservoirs. However, for really fast sinking lines you have to have a good lead component mixed in with the PVC and this often determines the colour of the line. There is also a new movement overseas away from PVC standard line. These lines have a braided nylon or Dacron core which is generally made up of 25-30lb breaking strain. Some of the new lines that are being produced are Teflon coated. These are called the low stretch lines and the coating is applied over a pre-stretched nylon core. Over the years to come no doubt the lines will slowly change. It is often in the angler’s interest to change with them as the presentation of the line to the water is one of the most important parts of fly ﬁshing.